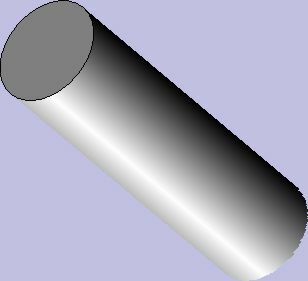 This little project arose as part of a discussion in the newsgroup about "How can I draw a cylinder?" 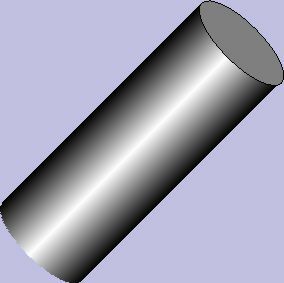 As far as I can tell, the poster really needed to use something like OpenGL or Direct3D to draw the image of a cylinder, but it got me thinking about a simpler problem, how to create a cylindrical image, which I might want to use as, for example, a histogram element. Besides, I was trapped on an airplane going to San Diego, and it was either write code or read science fiction, so this seemed a bit more productive. 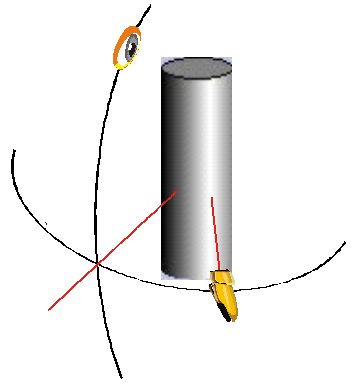 The Cylinder program is shown here. It has some sliders that control the width and height of the cylinder (expressed as a percentage of the total drawing area), the angle of the view, and the angle of the light. There are a couple buttons to specify the color scheme used for the dark and light parts of the drawing. Other than a table, which takes 25 lines, the actual code that does the cylinder drawing is less than 70 lines of declarations and computations. So the whole thing is under 100 lines of code. The remaining 3,700 lines are simple methods that set/get the parameters to the drawing, and provide all the support, pretty buttons, fancy slider controls, and similar parts of the interaction. About 1300 lines of source code provide the basic interaction. A lot of these deal with the fact that I chose to make the dialog resizable, and the controls float around on it (this is the closest I've come to going to the effort to get a control geometry manager package installed). 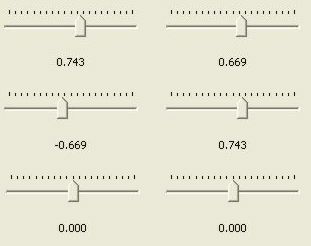 I worked out the basic highlighting technique using my GradientFill Explorer; it takes four points to specify the cylinder fill: from dark to light, and from light to dark. So the question was, how hard would this be to draw using just straight GDI functions, not requiring any 3-D support? The answer is obviously "yes" because I have demonstrably done it. However, I was on my own to perform all the geometric computations required to make this so. Also, I did not attempt to "rotate" the cylinder itself, or allow anything to be inside it, or try to give a perspective drawing as the viewing angle changed. So I have made a number of simplifying assumptions here that allow me to do a number of simpler drawing techniques than would be required to generally show a 3-D cylinder shape from any angle, or with perspective. This is not entirely obvious how to get the best-looking effect. My first attempt, for example, just did a double-gradient-fill effect with the left and right endpoints forming a 4-strip gradient fill; this is the 0 effect. The problem was that as I changed the angle, the left end (moving to the left) or right end (moving to the right) remained at the same intensity on the edge, which was the dark color. This was not a satisfactory illusion. The illustration below is captured from the GradientFill Explorer. It you look at this, it does not look like the image is a smooth cylinder; our experience tells us that the dark edge must be the same distance away from our eyes on each side, and therefore it looks like the curve suddenly becomes tighter after the highlighted area. Clicking the Enable Transformation Matrix check box enables the matrix controls. Selects the edge and center colors for the cylinder. These two buttons together are gradient-filled with the selected colors. 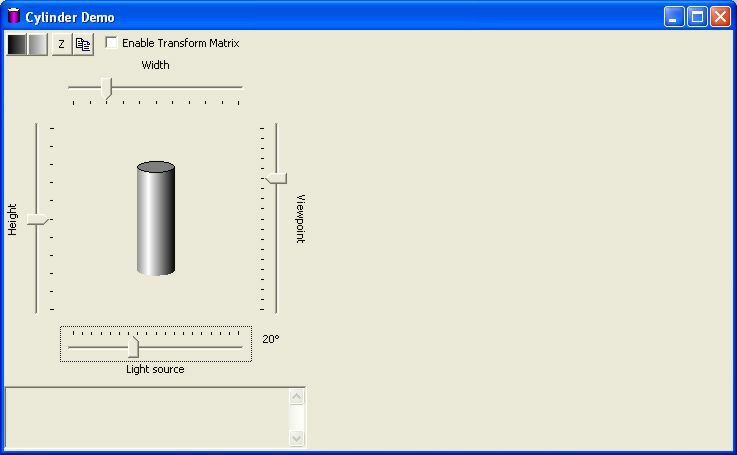 Plugs values into the transformation matrix for a rotational transformation. Note that using this control will replace the values for M11, M12, M21 and M22. It will leave Dx and Dy unchanged. The angle of rotation is displayed at the bottom. The range of rotation is from -90° to +90°. The interesting thing about this experiment was that, while it was clearly more complex than it would take to draw a cylinder using something like OpenGL, it was not impossible, or, once the basic ideas were established, even particularly difficult. The trick was in figuring out the sequence of operations. This is shown in the code below. Note that there is no need to do this complex operation if the GM_ADVANCED graphics mode is used, so the "original" code is used. The parameters of the Cylinder class are set with the methods of the class. There would be one instance of a Cylinder object for each cylinder to be drawn. 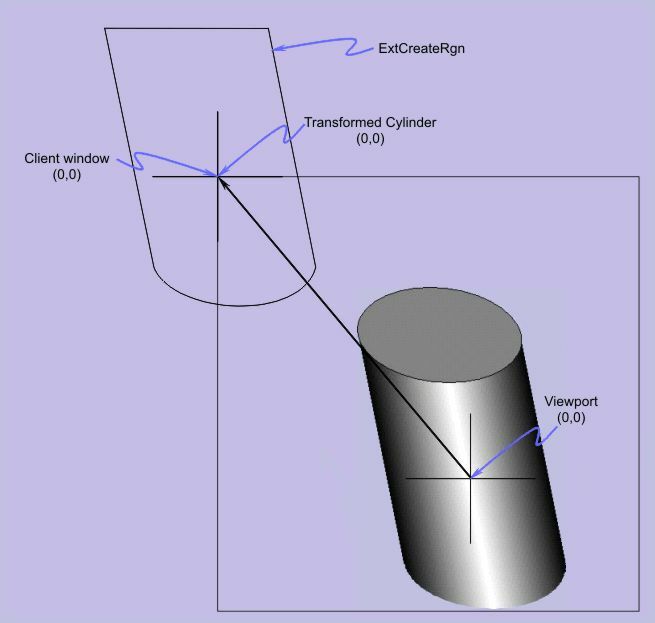 void Draw(CDC & dc); Draws the cylinder object on the DC, based on the parameters which have been set. The constructor sets specific defaults. int GetHeight(); Retrieves the height of the cylinder, in logical units. COLORREF GetLightColor(); Retrieves the light highlighting color of the cylinder. CPoint GetPos(); Retrieves the position of the centroid of the cylinder in logical coordinates. CSize GetSize(); Retrieves the current width and height of the cylinder in logical units. int GetWidth(); Retrieves the current width of the cylinder in logical units. void SetColor(COLORREF light, COLORREF dark); Sets the two colors used for the lighting effects. If this is not called, a default color is used. void SetDarkColor(COLORREF c); Sets the dark color used for the lighting effects. If this is not called, a default color is used. void SetEyeAngle(int degrees); Sets the viewing angle, in degrees. If this is not called, a default value is used. The viewing angle is limited to the range -45° to +45°. void SetHeight(int height); Sets the cylinder height in logical units. If this is not called, a default value is used. void SetLightingAngle(int degrees); Sets the lighting angle, in degrees. If this is not called, a default value is used. The lighting angle is limited to the range -90° to +90°. void SetLightColor(COLORREF c); Sets the light color for the highlighting. If this is not called, a default color is used. 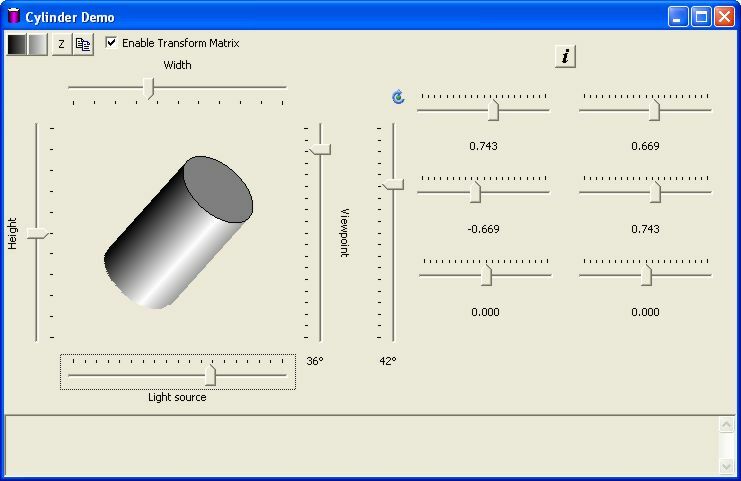 void SetMatrix(XFORM * M); Sets the transformation matrix to be used for drawing the cylinder. 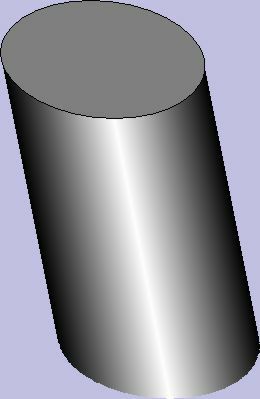 If the value is NULL, the cylinder can only be drawn vertically using the base GDI functionality. void SetPos(int x, int y); Sets the centroid position for the cylinder. If this is not called, a default value is used. 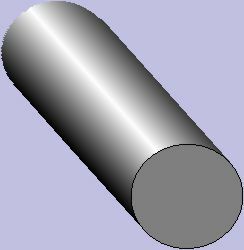 void SetSize(CSize sz); Sets the width and height of the cylinder. If this is not called, a default value is used. 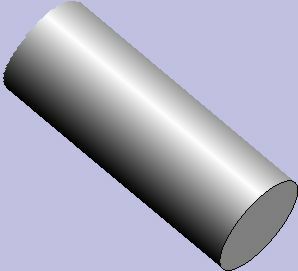 void SetWidth(int width); Sets the width of the cylinder. If this is not called, a default value is used. Changing any of these assumptions can result in a slightly-more-difficult to nearly-impossible situation. 30-Mar-08 Hans-J. Ude's suggestion for flicker-free code reduction was added. I was just feeling lazy, so I thank him for his contribution. Special thanks also to "Nivel" who converted the .wmf files to .png files for wider browser compatibility. Copyright © 2008 FlounderCraft, Ltd., All Rights Reserved.